It’s Time D-Heads! 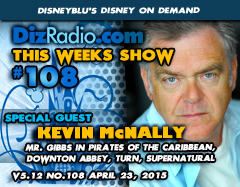 This week we sail the seas with The Black Pearl as we welcome KEVIN McNALLY (Gibbs in Every Pirates of the Caribbean Film, Downton Abbey, Turn: Washington’s Spies, Supernatural) to the show. Kevin stops in and talks about his career, films, upcoming projects, and the latest Pirates film as we stops in live from the set of the current Pirates film. We have the D-Team back as Erin answers those questions in I Want To Know, Caitlin has the latest from the Walt Disney World Resort in WDW-In-2 and Jason digs deep into The Vault with another Blu-Ray or DVD to add to your collection. Paige heads up the Magical Music Review and Nathan looks back at This Week In Disney History. We have a ton of news hot off the D-Wire with information on Star Wars Weekends, Disney Cruise Lines, Doc McStuffins, Penn Zero, Marvel Apps, The Good Dinosaur, Inside Out, Avengers, Clothing, Magic Kingdom, Disneyland and so much more.